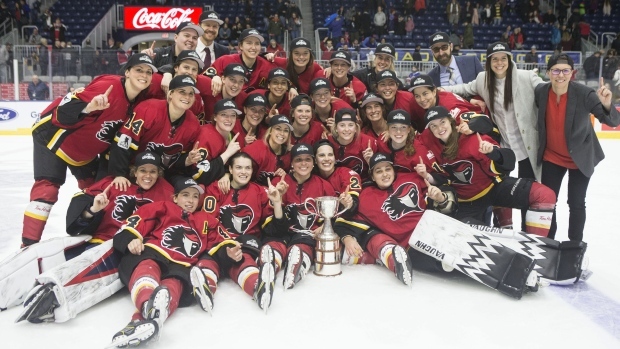 TORONTO — Zoe Hickel had two goals as the Calgary Inferno defeated Les Canadiennes de Montreal 5-2 on Sunday at Coca-Cola Coliseum for their second Clarkson Cup title in franchise history. Brianna Decker, Halli Krzyzaniak and Rebecca Johnston, into an empty net, also scored for the Inferno. Ann-Sophie Bettez had both goals for Les Canadiennes. After being named goaltender of the year on Friday, Alex Rigsby made 25 saves for Calgary. Award finalist Emerance Maschmeyer turned aside 26 shots in a losing effort. Marie-Philip Poulin, fresh off capturing her third CWHL most valuable player award in four years, did not see the ice after taking the ceremonial puck drop prior to the game. The Montreal captain, who led the league with 50 points and 23 goals, was hurt in the final game of the regular season. She missed the final with a lower-body injury. Calgary got off to a fast start in the first period as the Inferno's Johnston wheeled around the Montreal zone and fired a shot off the far post a few minutes into the period. The Inferno continued to press with Les Canadiennes forward Sarah Lefort drawing a hooking penalty at 4:52 after Decker slipped a pass into the slot for a good scoring chance. Montreal killed off the penalty, but Calgary opened the scoring shortly after as Inferno defender Katelyn Gosling fired a slap-pass to Hickel, who tipped it past Maschmeyer to make it 1-0 at 7:59. Several minutes later, Calgary forward Brianne Jenner slipped into the Montreal zone and put on a great display of puck skills after falling to her knees. The Inferno maintained possession and worked the puck around to Krzyzaniak, who scored on a shot from the point to put Calgary ahead 2-0 at 12:59. Jenner continued her dominating first period, breaking in all alone and nearly stretching the lead to three, but she missed just wide after dekeing out Maschmeyer. Les Canadiennes made a push early in the second period. Bettez cut the deficit to 2-1 after receiving a pass from Sarah Lefort in the left faceoff circle and sending a spinning backhand between Rigsby's legs at 3:43. A Montreal hooking penalty by Karell Emard illed some of her team's momentum. Kacey Bellamy later connected with Decker, who blasted a shot past Maschmeyer on the ensuing power play as the Inferno stretched the lead to 3-1 at 12:42. However, back-to-back penalties for Calgary (Jenner for goalie interference at 15:49 and Blayre Turnbull body checking at 16:48) opened the door for Montreal. With a 5-on-3 advantage, Hilary Knight set up Bettez with a slick between-the-legs pass as Montreal cut the deficit to one goal at 17:37. The Canadiennes thought they had squared the game 31 seconds into the third period when Erin Ambrose found the back of the net, but the goal was waved off for goalie interference. Rigsby came up big to start the period, standing tall as Montreal pressed on a power play after Calgary's Rebecca Leslie was sent off for bodychecking. Johnston found Hickel in the slot and she fired a quick shot at 6:24 that restored Calgary's two-goal cushion. Montreal went 1 for 6 on the power play while Calgary was 1 for 5 with the man advantage. Calgary also beat Montreal to win its first Clarkson Cup title in 2016. It was the third time the teams have met in the final over the last four years. Les Canadiennes, who beat the Inferno in 2017, have won the Clarkson Cup a league-best four times.